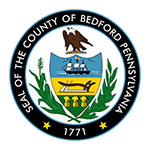 The Bedford County Jury Selection Commission is responsible for providing a qualified pool of jurors to ensure the right of all citizens to a trial by an impartial jury. Citizens who fulfill their jury service obligation are continuing a tradition established under the United States Constitution over two hundred years ago. Indeed, the right to a trial by an impartial jury of one's peers is an integral part of the foundation of American democracy. If by the end of your first day of service you have not been selected for a jury you will be excused from further service for five years. If you have any questions or comments, feel free to contact the Court Administrator's Office at (814) 623-4812. 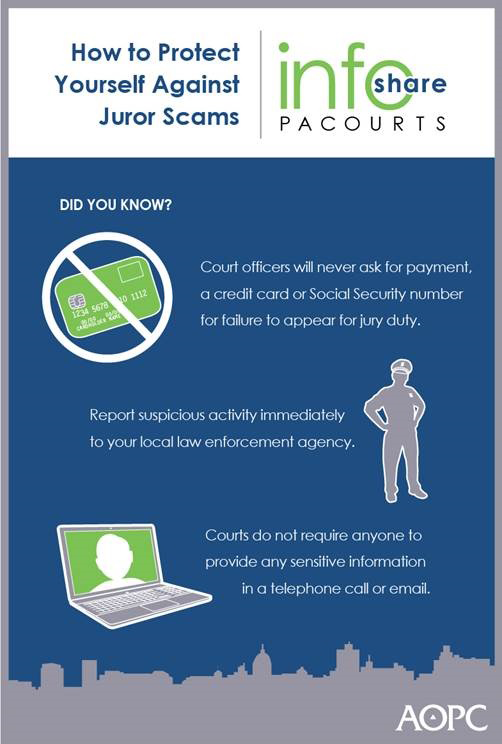 HARRISBURG - Although juror scams are not new, Pennsylvania courts remind people to be alert and to never give out sensitive information over the phone, even if they are being threatened with prosecution for failing to comply with jury service, which is a typical ploy in such scams. A juror scam may go something like this: you get a call from someone claiming to be from the courts or a law enforcement organization and their records show you didn't show up for jury duty. You can either pay the fine, or get arrested. The caller says payment is accepted over the phone or by wire service. Stop right there and hang up. These calls - and sometimes emails - are fraudulent and are not connected with Pennsylvania courts. The courts do not require anyone to provide any sensitive information in a telephone call or email. Jury duty is a vital civic responsibility. Jurors should know that most contact between a court and a prospective juror is through the mail, and any phone contact by real court officials will not include requests for Social Security numbers, credit card numbers or any other sensitive information. It's a crime for anyone to falsely represent himself or herself as a court or law enforcement official. Pennsylvanians receiving such a telephone call or email should not provide the requested information and should notify their local law enforcement agency.